The cluster has an apparent magnitude of 9.06 and lies at a distance of 29,400 light years from Earth. It has the designation NGC 6681 in the New General Catalogue. In binoculars, M70 appears like an out-of-focus star and is best observed with a telescope. Individual stars in the cluster can only be resolved with large amateur telescopes, but even small ones will reveal a distinctly non-stellar object, with a bright core inside a fuzzy ball of light. 10-inch telescopes will resolve the stars in the outer regions of the cluster. Messier 70 is pretty easy to find using the Teapot asterism. 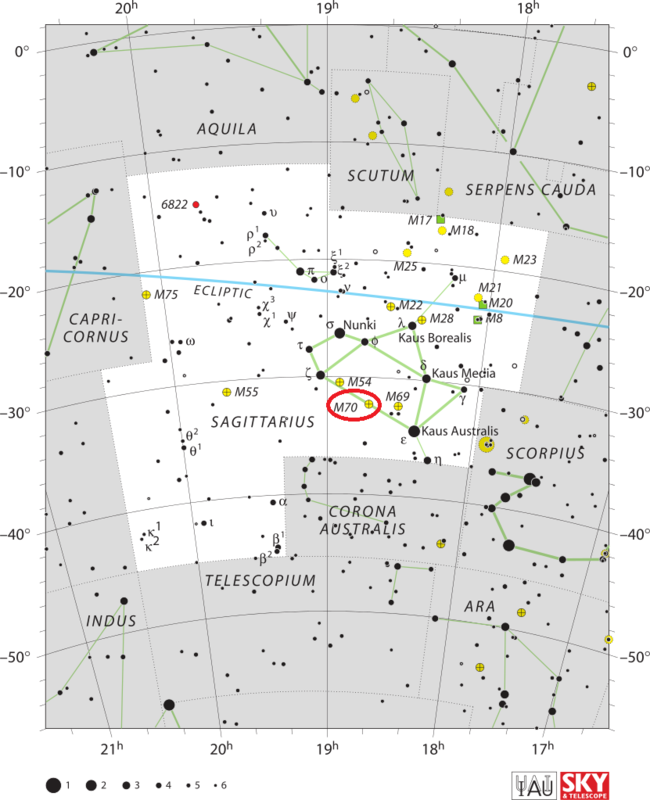 It is located almost exactly halfway between the two stars at the base of the Teapot: Kaus Australis (Epsilon Sagittarii) and Ascella (Zeta Sagittarii). The best time of year to observe M70 is during the months of June, July and August, but it can be a difficult target for northern observers because it never rises high above the southern horizon. Messier 70 occupies an area of 8 arc minutes of apparent sky, which corresponds to a linear diameter of 68 light years. The cluster appears considerably smaller when observed with amateur telescopes because its bright centre is only about 4 arc minutes in diameter. The cluster is moving away from us at an approximate velocity of 200 km/s. Its estimated age is 12.8 billion years. 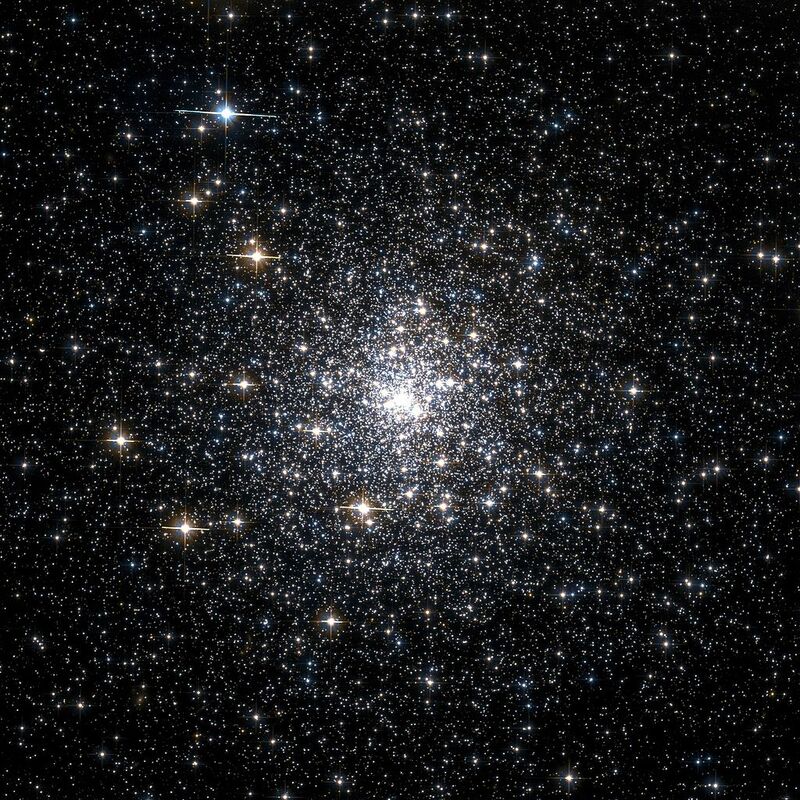 In this image, the NASA/ESA Hubble Space Telescope has captured the brilliance of the compact centre of Messier 70, a globular cluster. Quarters are always tight in globular clusters, where the mutual hold of gravity binds together hundreds of thousands of stars in a small region of space. Having this many shining stars piled on top of one another from our perspective makes globular clusters a popular target for amateur skywatchers and scientists alike. Messier 70 offers a special case because it has undergone what is known as a core collapse. In these clusters, even more stars squeeze into the object’s core than on average, such that the brightness of the cluster increases steadily towards its centre. The legions of stars in a globular cluster orbit about a shared centre of gravity. Some stars maintain relatively circular orbits, while others loop out into the cluster’s fringes. As the stars interact with each other over time, lighter stars tend to pick up speed and migrate out toward the cluster’s edges, while the heavier stars slow and congregate in orbits toward the centre. This huddling effect produces the denser, brighter centres characteristic of core-collapsed clusters. About a fifth of the more than 150 globular clusters in the Milky Way have undergone a core collapse. Although many globular clusters call the galaxy’s edges home, Messier 70 orbits close to the Milky Way’s centre, around 30 000 light-years away from the Solar System. It is remarkable that Messier 70 has held together so well, given the strong gravitational pull of the Milky Way’s hub. Messier 70 is only about 68 light-years in diameter and can be seen, albeit very faintly, with binoculars in dark skies in the constellation of Sagittarius (The Archer). French astronomer Charles Messier documented the object in 1780 as the seventieth entry in his famous astronomical catalogue. 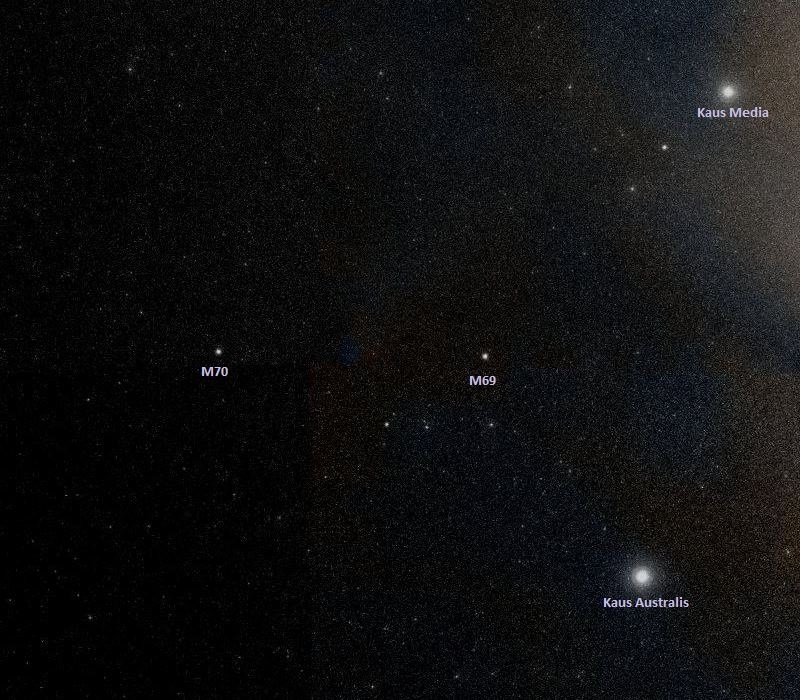 Like its close neighbour M69, M70 is located near the galactic centre. The two globulars are similar in size and brightness, and separated by only 1,800 light years. M70 is slightly larger and more luminous of the two. With a density classification of V, M70 has an average concentration of stars. However, it is one of the clusters that have undergone a core collapse and, as a result, it has an extremely dense core. 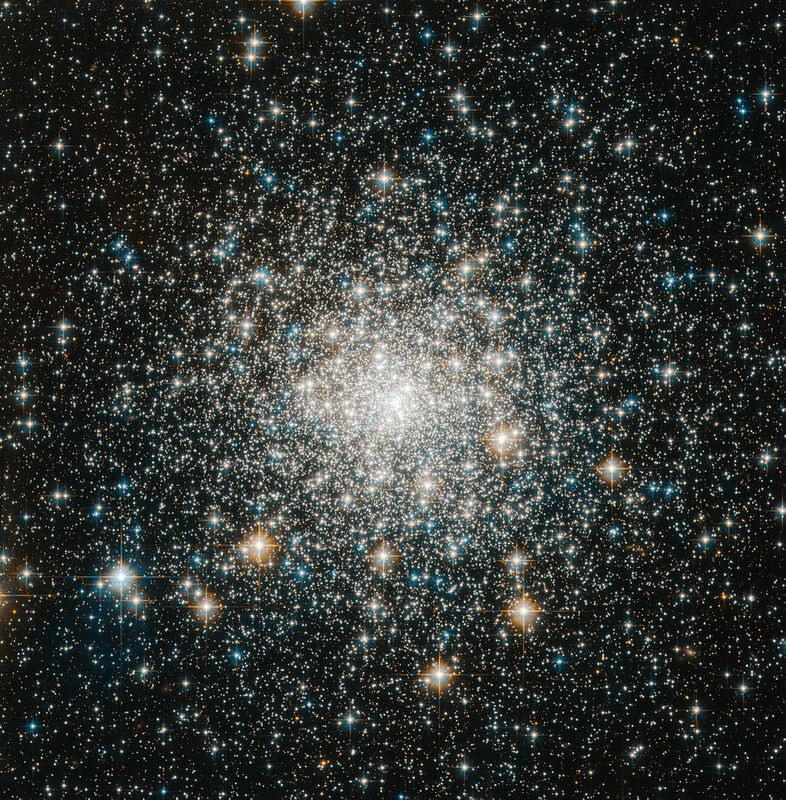 Other Messier globulars that have suffered the same fate include Messier 15, Messier 30 and possibly Messier 62 and Messier 79. At least 21 and up to 29 Milky Way globulars are known to have undergone a core collapse. Messier 70 contains approximately 75,000 stars, but has only two known variables. The estimated mass of the cluster is about 179,000 solar masses. M70 is slightly more metal-poor than M69, with about 4.5 percent of the Sun’s heavy elements. Even though both clusters lie near the galactic centre, M69 has five times the amount of heavy elements of M70. This is because M69 always stays close to the Milky Way centre, while M70 travels in and out following an eccentric orbit. Messier 70 became famous in 1995, as it was the target that amateur astronomers Alan Hale and Thomas Bopp were observing when they discovered the comet Hale-Bopp on July 23 of that year. John Herschel catalogued M70 as h 3756, describing it as a “globular cluster; bright; round; gradually much brighter toward the middle; diameter in RA = 7.0s [1.75′]; resolved into stars of 14 to 17 m.“ He later added the cluster to the General Catalogue as GC 4428.